Drawing and painting on location from direct observation is at the heart of my practice. I have shown my work throughout the UK since 1994, winning several professional exhibition awards. This included the Lynn Painter-Stainers Prize in 2014 for creative representational painting at the Mall Galleries, London. My work is represented by the Open Eye Gallery, Edinburgh with successful solo exhibitions in 2013 and 2015. Born in 1970, I spent my childhood in Kilkeel, Northern Ireland before going Grammar School in Belfast. In 1989 I completed the art Foundation at Manchester Polytechnic enabling me to study Illustration at Liverpool John Moore’s University. In 1995, I became resident artist at Heathfield School in Ascot whilst undertaking a Masters Degree at Buckinghamshire Chilterns University College. I have been living in Edinburgh since 2007 where I continue to combine a career as both an artist and educator. I am currently involved with the planning and delivery of courses at University of Edinburgh, Leith School of Art, The National Galleries of Scotland and at Loretto School in Musselburgh. As a child as I was never happier than when I was drawing. Encouraged to play outdoors, I loved exploring and mapping the Northern Irish coastline and mountains. As an illustration student in Liverpool, I was able to reconnect these experiences in the landscape and to draw the things I see. Frustrated with my inability to invent for illustration briefs I went out into the city to draw. I worked in pen and ink, exploring line and marks in a direct response to the urban landscape – a process that just felt right and I continue to explore the possibilities and inventiveness making art from direct point of reference. 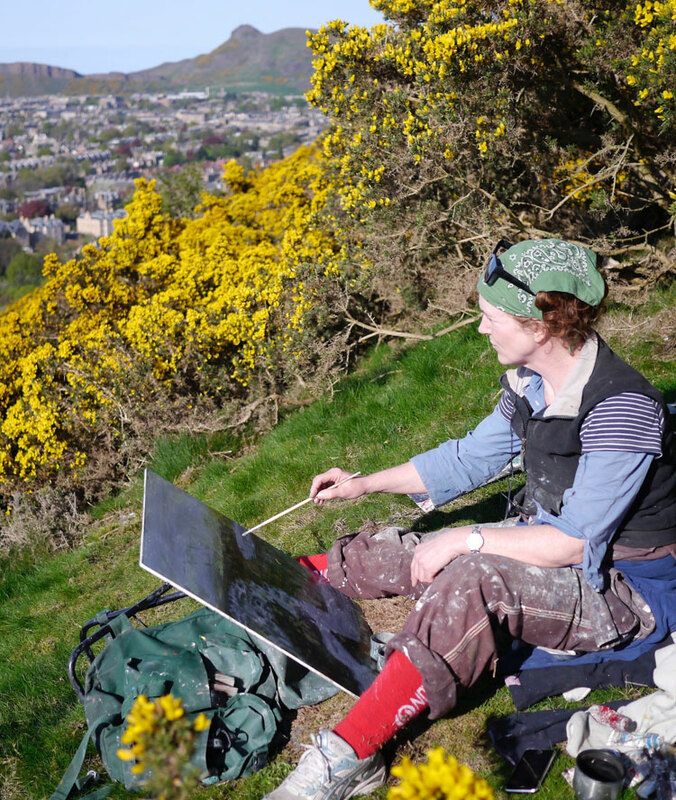 I relocated to Edinburgh in 2007 and the city’s natural panoramas and familiar vistas allowed me to develop a visual language that references both the ‘plein air’ tradition of the Scottish landscape and contemporary art practices. 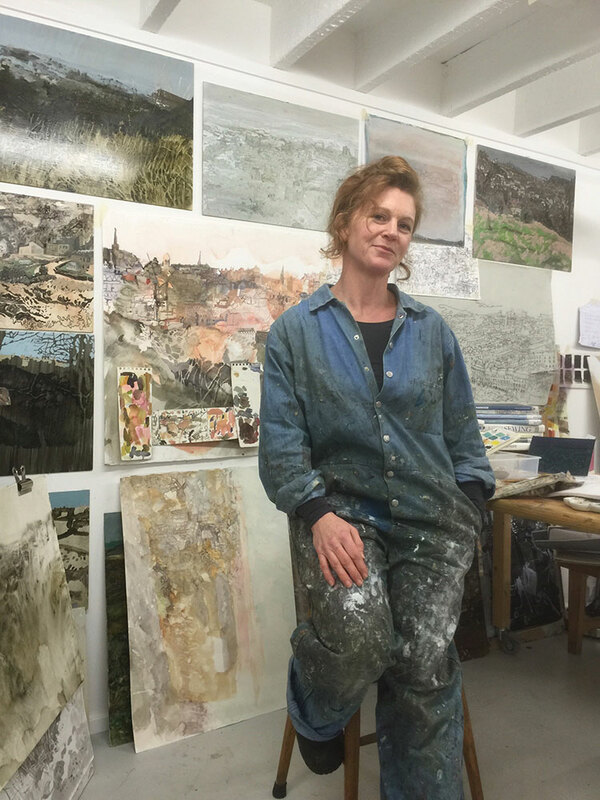 The logistical challenges making drawings, oil paintings and watercolours from places such as Calton Hill and Blackford Hill enabled me to develop practices and techniques and make works with greater ambition and purpose. Each work, or body of works is a response to a particular a place, a moment in time or an idea. The parameters that come from working on location are in a constant state of flux – no two experiences are the same. I thrive and produce my most interesting work when I trust my intuition and I am able commit wholly to the situation. Looking is the most important aspect of my work, but all my senses play a role. I begin the initial research process by going on walks, making abbreviated drawings of things that interest me. I return later and make small paintings moving from one location to another, figuring out and making connections, like a story or a web of interrelated ideas.